This unit combines the functions of a video-scaler, scan-converter, and format transformer into a compact and durable metal housing with easy-to-use touch buttons. The CP-251F is controlled via push button and OSD menu. The controls include input/output setup picture adjustment, H/V phase adjustment, and many other advanced features. This unit combines the functions of a video-scaler, scan-converter, and format transformer into a compact and durable metal housing with easy-to-use touch buttons. 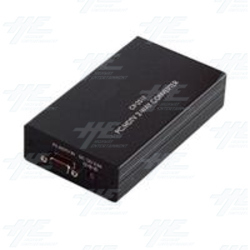 CP-251F not only is a video scaler it is also a scan converter and a format transformer. Easy- to- use push buttons and OSD menu control.